“A theology of the cross calls the thing what it actually is.” Martin Luther, Heidelberg Disputation, Art. 21. This week we saw a decorated four-star general with a distinguished record of service to his country disgrace himself and his uniform by trying to explain away the mad ramblings of an emotionally unstable president with rank lies about an elected member of the house of representatives. In response to queries about that by an incredulous press, we heard the president’s press secretary tell reporters that military leaders are not to be questioned. Meanwhile, a state university in Florida hosted a white supremacist whose demagoguery incited the same kind of violence against protesters that occurred at his appearance in Charlottesville last summer, thankfully without the same tragic results. Am I the only one who finds it passing strange that white supremacist Richard Spencer is given a platform to preach his racist idiocy at an expense to the taxpayers of over half a million dollars while reporters asking questions about the public statement of a military leader are told to shut up? Are we still in the United States of America? More disturbing than the current administration’s shredding of the constitution, a university’s dignifying racist yammering and the absolute disregard for truth that has washed like tsunami over our nation is the religious underpinning for all this so generously provided by the evangelical wing of American religion. The president’s equivocation (to put it charitably) on the violence in Charlottesville resulted in so many resignations from his Strategic and Policy Forum and Manufacturing Jobs Initiative councils that he was forced to disband both. But labeling neo Nazis and clansmen “fine people” was not enough to tickle the gag reflexes of Mr. Trump’s religious advisory council. Unlike the captains of industry, these religious figures didn’t feel that a little racism (to say nothing of sexual predatory conduct) is anything over which to become upset. If God has placed the Donald in the White House (and yes, that’s what these folks are saying), then opposing the Donald is opposing God. All of this might be laughable-except that God’s presidential appointee is in the process of deporting children to countries where they have never lived, don’t speak the language and have no cultural or even family ties. We might just shake our heads, sigh and go on with our business-except that this president is bringing us closer every day to an unwinnable military conflict that could well bring ours and everyone else’s business to an abrupt end. We might shrug our shoulders and take the attitude that life goes on-except it might not and surely will not for the growing number of victims of hate crimes incited by Trumpist dog whistling. We might dismiss idiots like Richard Spencer as harmless clowns dancing around outside the margins of respectable society, spewing their venom but harming no one. But Mr. Spencer is not muttering his malarkey into a beer mug at a dark pub in the hearing only of some unfortunate bartender, where ten years ago we would have expected to find such sorry specimens of humanity. Instead, he is speaking at publicly funded universities and even landing interviews with NPR. Overt racism, once unthinkable in polite society, is becoming as American as apple pie-again. “The truth will make you free” Jesus declares in this Sunday’s Reformation gospel. The sad corollary is that lies imprison us. We are currently enslaved by a congress that has been lying to itself and to us about the obvious fact that we have managed to elect a deeply paranoid, narcissistic and delusional man to the highest office in the land and armed him with the deadliest arsenal on the planet. We are being lied to by well-meaning leaders who suggest that, if we just learn to talk nice to each other, we can come together and solve the country’s problems-except that inviting people of color to discuss commonalities with those who want to lynch them is a mighty big ask. Moreover, anyone who thinks that welcoming Spencer and his hoards into the political mainstream will domesticate them would do well to remember the Weimar Republic’s last prime minister, Paul von Hindenburg, who named Adolf Hitler chancellor of the republic in hopes that the responsibilities of governing would curb his fanaticism. We are being lied to by the church and not only that heretical fragment ensconced in the Trump White House. We are also being lied to by a mainline church that, in my view, has failed to recognize and name the evil we face for what it is-a nationalistic, militaristic and racist revival of xenophobic populism that is taking root not only in the United States but in democracies everywhere. Let us be clear: this has nothing to do with disputes over politics, economics and social policies about which reasonable persons of good will might well disagree. Toning down the rhetoric alone will not bring us back to civility and peace. The election of 2016 has ignited a tidal wave of racist, misogynist, xenophobic and homophobic hate that respects neither law nor policy. This irrational madness has placed the mad man in the White House. That is the hard truth that needs to be spoken. 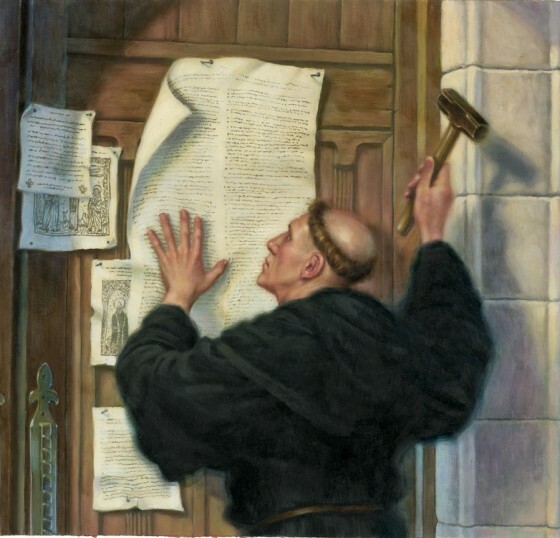 Five hundred years ago Martin Luther posted ninety-five theses on the door of the church in Wittenberg for discussion and debate with this preface: “Out of love for the truth.” His was a challenge to the church of his day to engage in frank and fearless discussion about what he saw to be the blinding lies holding captive the people of God. If we want to be faithful to the reformation tradition, I believe we need to hear that call today. I think Martin is calling us to name truthfully the evil confronting us for what it is. Moreover, we (especially those of us in the white, straight, male category) need to take a careful inventory of the ways in which we have contributed to the making of the Trump presidency by failing to recognize and confront the systemic oppression that has always existed at all levels of government, education and the work place. Donald Trump did not invent racism, sexism or homophobia. He only exploited it and made us painfully aware of a truth we have been reluctant to see. That might well be the one positive accomplishment of his presidency. As important as getting the mad man out of the White House surely is, getting the madness of entrenched bigotry out of our institutions and our hearts is by far the more daunting task. We desperately need bishops, theologians and pastoral leaders with courage to speak difficult truths to us and lead us on the hard journey of repentance and faith. However painful that path might be, it is the way to which Jesus calls us and the only way to freedom. Here is a poem by Anne Waldman about the inbreaking of truth. Can you feel the ground rumble under your feet? O Men of War, Censorious Ones! Source: In the Room of Never Grieve: New and Selected Poems, 1985-2003, (c. 2003 by Anne Waldman, pub. by Coffee House Press). Anne Waldman was born 1945 in Millville, New Jersey, but grew up in Manhattan. She was heavily influenced by Beat poets such as Allen Ginsberg and Gertrude Stein. She was educated at Bennington College in Vermont. Waldman has received honorary grants from the Foundation for Contemporary Performance Arts, the Poetry Foundation, and the National Endowment for the Arts. She co-founded the Poetry Is News collective poet Ammiel Alcalay in 2002. You can find out more about Anne Waldman and sample more of her poetry at the Poetry Foundation website. Jesus called them Snakes, Vipers, and that’s what they are. They’re misrepresentation of the gospel of Jesus Christ to the loss is he’ll is and one day they will give an account for rhis. You speak truth to power. We need that. Thank you.